After Ministry of Foreign Affairs of Turkey made a statement on February 9 and announced that Uyghur musician and folk poet Abdurehim Heyit lost his life in prison in China, where has been behind bars for two years, China has released a video denying the allegations. 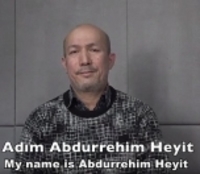 In the video dated February 10, the person who introduced himself as Abdurehim Heyit said, "My name is Abdurehim Heyit. Today is February 10, 2019. I am in the process of being investigated for allegedly violating the national laws. I am now in good health and have never been abused." After it was widely rumored on social media that Abdurehim Heyit, the world renowned musician and folk poet of the Uyghur Turks, lost his life in prison in China, the country was protested in different parts of the world. In response to the allegations, the state radio channel CRI's Turkey service posted a statement on Twitter and said, "Abdurehim is not dead. The allegations of Ministry of Foreign Affairs of Turkey about Xinjiang are baseless. It has been announced that Abdurehim is in good health." "We have learned with deep sorrow the passing away in his second year of imprisonment of the distinguished folk poet Abdurehim Heyit, who was sentenced to eight years in prison for one of his songs. "This tragedy has further reinforced the reaction of Turkish public opinion towards serious human rights violations committed in Xinjiang. We expect this legitimate response to be taken into account by Chinese authorities." The Ankara Embassy of China responded to this statement yesterday (February 10) by saying, "The related statements of the spokesperson of Turkey's Ministry of Foreign Affairs are completely unreal. The Chinese side has been fiercely opposing to these statements." Abdurehim Heyit is an Uyghur folk poet and musician. He was born in the province of Kashgar in Xinjiang Autonomous Region in China in 1964. Receiving education at a school of fine arts in Kashgar, Heyit has become a world renowned folk poet, especially known for his performances of dutar, a two-stringed traditional instrument. Composing several Uyghur songs, Heyit also gave a concert in Gazi University in the capital city of Ankara in 2015. Being detained due to one of his compositions in Urumqi in 2017, Heyit has been sentenced to 8 years in prison.